How much weight can delivery drones carry? New delivery drone database is up! Payload capacity is one of the major obstacles to full-fledged and profitable commercial drone delivery networks. The average weight unmanned aerial vehicles roughly classified as commercial delivery drones can carry is approximately 4.8 lbs (2.2 kg). Below you will find a table/graphic comparing the payload capacity of some of the top delivery drone concepts vying to become the first commercial drone delivery network either in the US or abroad. You might be wondering why the package delivery drones we see in the news can only lift a limited amount weight. Why is there a restriction in the size of the items that can be delivered? Doesn’t a small payload mean an order would have to be split into multiple shipments thereby increasing overall delivery costs which will be passed on to consumers? Is it all a conspiracy to prey upon unaware costumers who desperately want their high-value items within 30 minutes (or less) and thus are willing to pay premium shipping? Well, not necessarily. Drone payload capacity is influenced by a combination of factors such as motor power, propeller size, number of propellers, battery type, frame weight and even the UAV’s operating altitude above sea level. The biggest constraint, however, is battery capacity as this dictates the amount of power available to generate the propeller thrust required to counter the force of gravity. For example, rule of thumb decrees that to maintain stable flight, the required propeller thrust is 2x the amount of total weight of the drone. As such, if a drone weighs 2.2 lb (1 kg) and carries a 4.4 lb (2 kg) payload, it would require enough power to lift 12.12 lb (6 kg). In other words, the bigger the payload, the bigger the lift requirement. The bigger the lift requirement, the bigger the battery that is needed. The bigger the battery, the bigger the total payload and lift requirement and so on in a vicious cycle. Of course, ways to mitigate this include the use of more motors (octocopters vs quadcopters) and larger propellers to provide more lift capacity. However, the addition of these would require heavier frames which in turn means more weight and higher power requirements. It is all a complex balancing act. The key is to find the practical and safe sweet spot between size, weight and power for each drone’s specific purpose. At the moment, cargo drones can already deliver a 4000 lb (1814 kg) automobile to your driveway, but that would require the military grade 51 ft 10 in (15.8 m) long unmanned Kmax power lift helicopter with a 48 ft 3 in (14.7 m) rotor diameter. Probably a bit of overkill but if you take it down a notch, the XactSense MAX 8 can deliver a 20 lb (9 kg) package to your doorstep at the more manageable cost of US$ 65,000 per unit. 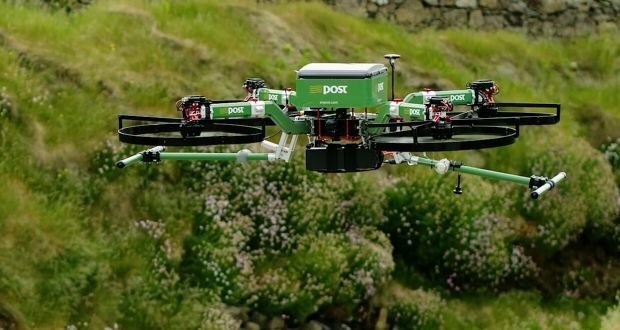 Nevertheless, this would be a significant investment from any firm if the MAX 8 were to become its workhorse in a package delivery drone network system. This doesn’t even take into consideration the potential fallout from the damage that might occur from maneuvering these large and cumbersome high payload drones around the obstacles typically found in urban or suburban landscapes (i.e. trees, powerlines, etc). As such, it appears Amazon Prime Air-like drones are currently the best option for commercial delivery drone network systems. Given the 400 million annual shipments Amazon makes to US customers, is estimated that with an initial investment of $130 million to cover drone cost and support infrastructure and a budget of $350 million annually to cover operating expenses, Amazon would break even after the first year of operations with their Amazon Prime Air concept drones. The small payload of 5 pounds (2.3 kg), would be of no consequence as approximately 86 % of all orders shipped by Amazon weigh less than this. For now, the current balance between drone size and payload capacity seems to hover (no pun intended) at 4.4 lb (2 kg) given the current battery limitations. As technology progresses, hopefully payload limitation will become less and less of a problem. Only 37 more hurdles to go before commercial cargo delivery drone networks become a reality. What are your thoughts on the weight limitations of unmanned delivery drones? Comment below! Hey Drone nation! Query…if some of those drones can carry around 10 lbs..do you think that a flock of them could help with the distribution of water and other supplies from the ports of Puerto Rico to the interior areas where trucks and other delivery vehicles can’t go? It would be a lot of flights I realize, but it would also be a great way to increase interest and knowledge about the usefulness of drones. Delivering humanitarian aid to dangerous or unreachable places would be awesome in general, and really…the PR would be fantastic! Get ’em up!